Football season is around the corner, so it’s time for yet another 40 yard dash post. You just can’t get away from the 40 yard dash “trash talk” when coaches and athletes float inaccurate numbers from a 40 yard dash time. The 40 yard dash was an arbitrary number, just like the 72 ounce steak “eat in 1 hour and it’s free” in Amarillo Texas on Route 66. Someone chose 40 yards as the distance a football player needs to run, just like 72 ounces (4.5 pounds or over 2 kilograms!) of steak as simply a very large amount of steak eaten by one human in one sitting. Comparing a 40 yard dash and a 100 meter sprint is a moot point, but it’s fun to dissect and analyze. Don’t you hate it when you look at the splits, subtract their reaction time, and calculate Ben Johnson only ran 4.37 and Usain Bolt ran 4.35? (see chart below) These sprinters (among others) are the fastest men in the world in their era, and yet we hear football players with much faster times? Nothing against Football players, but they don’t train for the 100 meters like true 100 meter sprinters. Ego aside, how can a football player have a faster time than a sprinter? Then again, the WR for the standing long jump is held by a shot putter, and not a long jumper! Why Split Times are Bogus? In the 100m, you accelerate as long as possible to reach top speed, then maintain top speed. You want to cover the distance in the shortest possible time. The 40 yard dash is similar: your goal is to get to the 40 yard line as fast as possible from a motionless position. You have to overcome inertia, then reach top speed as fast as possible. It’s really unfair to use their actual 100 meter race splits and extrapolate their 40 yard dash time AS THEIR TRUE POTENTIAL. Why? 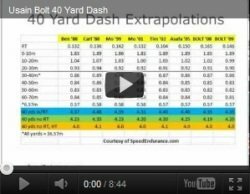 Because the extrapolated 40 yard dash time is merely an extrapolation or “split en route” to a 100 meters. Everyone is familiar with the different phases of a 100 meter sprint: reaction time, acceleration, transition, maintenance. Based on the real splits, especially the 30-40m split where the 40 yard lies, they have yet to reach their top end speed. But what would happen if they “trained seriously” for the event and reached their top speed earlier? 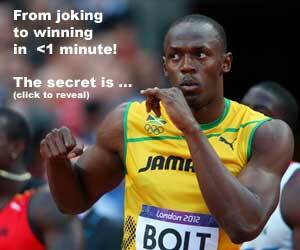 What if Ben Johnson or Usain Bolt trained to run the 40 yard dash (or 36.6 meter dash) as if it was a real event? Some Most football players treat the 40 yard dash as if it were a real event. A good or bad 40 yard dash time can make or break a football combine. And finally, what if you subtracted 0.24 from their FAT time to downward convert it to a hand time? We are looking at 3.9 to 4.0 hand time performances! WHO’S FASTER? Deion Sanders or Bolt? Below is a video comparing who is really faster, Deion Sanders 4.17 or Usain Bolt. In my example, we are ASSUMING world class sprinters can reach top speed at 30m, and not between 50-60 meter mark. You can mix and match the distances and phases around to add up to 40 yards. The chart is a fun illustration for discussion purposes. If the 4 phases are equal, then I would calculate using 9.15m splits to equal 36.6 meters. Thanks for taking my email and turning it into this article. You certainly explained it much more succinctly than I did when I broached the subject with you. I think I will use this to settle some debates with some friends in football circles. I look forward to others comments on this topic. You’re correct, Jimson. It would be off the charts if HB, BJ and company trained for the 40. A special mention for Bob Hayes on being inducted into the Football Hall of Fame yesterday in Canton, Ohio. He undoubtedly was a legitimate world class sprinter who would have also set the standard for the 40 yard dash if the NFL combine system of tests were in place back then. I believe he was the first to break the 6 second barrier in the 60 yard dash. I wonder what position Mr. Bolt would be the most effective at if he ever had been brought up to play football. The NFL coaches would be drooling. Do you think the Canadian Football League has ever approached him or any of the other Jamaican sprinters? @Fred – I think Usain would be better off playing Rugby! As far as the CFL goes, they’ll take anyone. Then again, it’s a hard sell with the 3 down football, but the playing field is much bigger. 3 downs are hard to sell? The CFL in its current form has been around since the 1950’s! And the trophy for the league has been around for 100 years! How stupid and ignorant are you. Your assumpions are flawed. World class sprinters do not reach there max speeds until 50-60 meters because THEY ARE world class srinters. IFTHEY COULD reach maximum speed by 30 meters THEN THEY WOULD not be world class sprinters. Put another way, sow me ANYONE who is capable of reaching his maximum speed by 30 meters and I will show you someone who is without question NOT a world class sprinter. Put another way still, the only way for a world class sprinter to be capable of reaching maximum speed at 30 meters is to become reconditioned…hardly a way to improve you 40 time. Sorry reconditioned should read deconditioned. For world class sprinters, what is potentially the shortest length someone could reach their max speed while sprinting? I, myself, have no idea but it would be interesting to find out with regards to each individual sprinter. Reaction, Acceleration, Transition, Maintenance — this way of seeing the 100 m is, in my view, both accurate AND telling when it comes to comparing sprints of different distances. I quite agree that the first pass comparison (subtract start, find average speed, extrapolate, add back start) is too simple to make accurate comparisons, and misses the boat for the 60y or 60m dashes because the finish line comes before the end of the acceleration phase for the top sprinters (but just barely) and there is no Maintenance in those races. (I agree as well that 100m en route splits miss the potential for adjustments in training and racing.) And while I agree that the higher one’s max velocity, the longer the acceleration phase as a rule, I must disagree that one cannot alter the acceleration phase. Take Jesse Owen’s old bunch/kangaroo start — you get out of the blocks a bit faster with slighter better turnover but you never hit your optimal stride pattern — that’s an obvious and simple way to hit the 40y faster but hurt the 100m finish time. And there are other adjustments possible to increase your short sprint time at a cost to final velocity or maintenance. I have one other note: I was football/track throughout my career and there are more incentives in football — there may well be football flyers who could have competed at the top levels in track but had no incentive to drop the generalist training program of football to do so. Hmmmm…. I made my point 3 different was and still failed to be clear. Let me try again. The 100 meter sprint is just that…a sprint. That is not to say that endurance plays no role but let’s be certain about one thing…world class sprinter run absolutely as fast as they can start to finish. Period…end of story. You say you can’t extrapulate a forty from a spit time and even if you could it isn’t an accurate reflection of their potential 40 because the don’t train for the forty. That of course is rediculous. Do you think world class sprinters and their coaches do not concern themselves with split times? Do you believe slit times are never used in training, rather only on the day of competition so spectators can muse over them and speculate about potential 40 times? I would submit to you world class sprinter train not only for 40 yards (or rather probably 40 meters) but also 10, 20, 60, and 80 meters. I submit that a world class sprinter would happily strive to trim time from any interval in the entire 100 meters and works tirelessly on that very thing. There is no intentional “hold back on the throttle until you get to 60 meter” mentality out there. When Usain Bolt runs the 100 meter dash he runs the first 40 meters (and first 40 yards) just as fast as he possibly can. If you don’t believe it just ask him. You might be 100 percent correct but who are you disputing? So, do you think that football players are faster than sprinters in the 40 yard dash? Go to the link and check out their other workout test results. It all matters. Has anybody thought about the fact that in real sprint events, wind readings are involved. Does anybody ever use a wind gauge when 40 yard dashes are being timed?? Who knows what kind of hurricane winds were assisting some of the better 40 yard times recorded. The NFL Combine is a tightly run ship with more gauges available and used than we could imagine. These guys leave nothing to chance. If there were any abnormalities with the wind factor during any time, they would have addressed the issue at that time. However, you should get props for thinking critically. Regardless of any skewed times, my Raiders grabbed 2 of the guys who had the best time by their position. The 49er’s also grabbed 2. Lots of speed this year for the Bay Area. But that’s nothing new for them as Speed City was right down the road in San Jose. Renaldo Nehemiah is a name that comes to mind as I think of speed and playing football in the Bay Area. To Joey Fowler – You are absolutely correct in your assumptions. Some coaches do train sprinters over the distances that you suggested. We are currently trying to determine how we can improve between 40M and 80M. Top reaction and acceleration can sometimes happen quicker in smaller lighter frame sprinters athletes. I was great even at an early age at the first 10-20 yards but lack body/muscle mass at longer distances to keep accelerating and maibtain speed. So I turned in a great 40. But I was a mediocre 100 sprinter. I ended up bein an ok 60 sprinter 6.4 in college. Nut as a jr high and high school football player did not have the size or strength, and just relied on my speed and agility, which others catch up later on to. I still admire smaller players in college and fewer in NFL that have not only speed, quickness, agility and mental acuity but mental and physical guts to actually suceed in the sport. That you cannot measure with a stop watch or electronics. The 40 is just one of many measurements and does not guarantee performance success. I would like to theorize though that if we had an event for 40 yard dash, that maybe indeed Husain Bolt and other world class 100m sprinters mau not end up the fastest at the 50 , just as most 200m and 400m world class sprinters are not the fastest 100m sprinters. Maybe a more compact leaner mass/body to leg ratio body type may be better suited or maybe a larger as many big defensive line men can blast good 20-40 yards but perhaps if leeaner, not sure, but thats why I think many high schoolers , 8th grade and up can turn in a good 40 yrd. time comparable to older larger and much more talented football players who specialize in their position versus a 16 year old that plays both sides of the ball at several positions and plays basketball and on the track team, but has not reached the level and compete with larger stronger players as to need to add muscle mass also to be successful and to endure being a running back etc. You may think wow if he can to a 4.45 at 15-1617 what can he do later may actually slow down as they get taller bigger or just slightly faster. I do think most of these times in high school are flawed and habdheld timed errors. Probably add .15 to.25 to times. But possible some are legit. But I doubt not much than a handful below 4.4 or 4.5. I was timed at 4.8 in 8th grade anoher guy was 4.3 and he was so much faster and older looking than any other back inthee league and ran a 10.3 in the 100 yard das (in 8th grade) but I only did 11.2 so i doubt if he ran a 4.3 prob 4.5 and mine was prob more like 4.75 as a timed start in 12th grade was 4.49 for me, which was probably right because an electronic best time in college was a 4.43 and I was done playing football just track. Unless they are a known phenom speedster that is tearing up the track and grid iron, i doubt sub 4.3 or even 4.4 legit electronic timed dashes exist for high school players. But again speed is nice but not everything in football. In track , its almost everything along with consistency and mental focus. I meant I was timed 4.6 in8th grade not 4.8 = but probably was most likely only 4.7-4.8. PS I ran the 60 in indoor track. Ive divulged my times obviously for merely discussions sake My observations based on my times are not obviously that of an elite sprinter in the past, but just as one interested in training aspects and athletic performance and as an avid spectator and enthisiast. You ran a 60y in 6.4 (pretty good) or a 60m in 6.4 (highly unlikely — as the world record is 6.39 by Mo Greene). Why is it so far fetched to think that a football player could post the same or possibly even better 40 time than a world class 100m sprinter ? … 100m sprinters train for just that … 100 meters, not 40 yards. 100m sprinters are often fastest at just that distance … 100 meters, not 40 yards. 100 meter dash and 40 yard dash are two COMPLETELY different sprints. 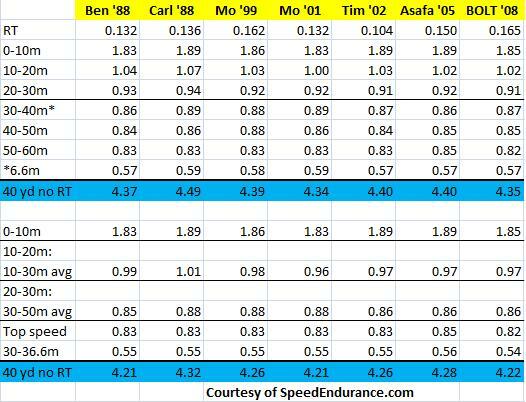 Yes, many 100m sprinters obviously have fast 40 times but, more often than not, their fastest times come after a full 100 meters, not 40 yards. A better question would be why do football players post faster 40 times than 50 or 60 meter sprinters. There’s still a big difference between 50 meters and 40 yards, but it’s a much better comparison than 100 meters vs 40 yards at least. You guys are acting like professional football players are just a bunch of muscleheads/entertainers playing a ‘ game ‘ and that they don’t focus on speed like sprinters do when the exact opposite is true. Speed/acceleration/explosiveness are usually THE most important factors in football. Whether you are talking about 2 yards, 5 yards, 10 yards, 40 yards or even 60 yards, EVERY position on the field relies on speed/quickness HEAVILY and 99% of the time 40 yard and less speed is MUCH more important than 100 meter speed, so that is what they train for and they train their asses off lol. Players that post the fastest 40 times are often decorated collegiate sprinters as well and could have had tremendous careers in track so it’s not that surprising that the fastest NFL players post world class 40 times because thats what they train extremely hard for. Just like 100m specialize in 100 meters, NFL players specialize in 40 yards or less. Some positions like kick/punt returners, cornerbacks and receivers obviously train for 60+ yards too, but 40 yards or less is usually the focus for all players and is a lot more important based on the nature of the game. There is a huge difference between hand times( football)and electronic times (sprinters). Hand times are very inaccurate. I know from years of timing track races that I’m usually at least .4 off the electronic time. This is simply due to the fact of reaction time. Most of the great 40y times that you hear about in football are hand times. Officially its a .24 difference, but that is only when you have trained officials and they are standing right beside the gun. You guys are missing a very key factor here. In track and field the sprinters react to a gun shot, in combines the timer is an electronic laser so the clock doesn’t start until the football player leaves the line. Which without a doubt could be make a huge factor in 40yds. That’s exactly right. Reaction time for the very best is 0.12-0.18 seconds and then a bit more for movement through the laser. So even if the combine uses electronic timing (from breaking the plane of the laser to the finish) there is about a 0.2 difference in times. 40y dash times taken on stopwatches are closer to 0.3 too fast (0.285) as the starter has to react to a sound (taking close to 0.2) and then hit the watch. As track and field athletes know, there is a big difference in using electronic time versus hand held timing. Also, there is a difference in having a start gun to which you must react versus being able to start yourself and then have the clock begin. Put any footballer on the starting line with Bolt, have them electronically timed, and then have them start when the gun goes off, so that reaction time also gets included, and I guarantee you that Bolt will bury them in the 40 yard dash. Agreed. A hand-timed 40y starting the watch on the first movement of the athlete is going to be about 0.16+0.29=0.45 seconds faster than an electronically timed start in a formal track race. 0.45 seconds is huge! Bolt and other top track men are probably in the 3.90s on a stopwatch starting on his first motion — faster than any NFL player. you guys have to remember that you can’t compare a football 40 yard dash with a track 40 yard split time because they are fundamentally different. For the football 40, the runner gets to start the time. As soon as he starts, the clock starts. For track and field, the runner will start as soon as the gun has been shot. Essentially, reaction time must be accounted for when calculating these times. There is a HUGE difference when you start to dissect these numbers down to the tenths and hundredths of seconds because of this difference. Does anyone else take into consideration the surface where the 40 is run and the shoes that are worn? Sure, in a track race there is the difference of reaction time, but there’s also the advantages of running on a surface designed for speed (mondo surface) and wearing spikes designed to maximize one’s speed on that surface. I think at the NFL combine, the 40 is run on a track like surface, but I still think that especially in a 40, being on a track with track spikes on would more than make up for the difference in reaction time. I think this is a good point, but I don’t think athletes at the combine in trainers lose more than 0.1, and probably less, relative to sprinters trained to use spikes. I’ve coached a long time, and spikes rarely add up to more than 0.1 s in a short sprint. HOWEVER, for old-time football players who ran on grass in cleats, the adjustment factor is probably MORE than the reaction time adjustment. I was not in league with the greats mentioned here, but my 100m was mid-high 10s yet my grass 40y in old Riddell cleats in college football was only 4.55. I could still run that fast in spikes on a track until I was 40. One of the things that really bugged me about this post was the fact the the author claimed that “the 40 yard dash was an arbitrary number” like the coaches choosed that number at random. Instead the whole point of the 40 yard dash is because the average amount of yards for a kick is 40 yards and a player needs at least 5 seconds to run there and get the ball before the other team does, so they needed a fast starting time with their top speed. They don’t have the time to pace themselves like with the 100 meter sprint. So don’t post something if you clearly haven’t done your research. Beside both football players and sprinters all have the same foundational muscles so with some trainer they could be good at the other type of run. I understand your desire to contribute, Mary, but you are wrong on numerous levels beginning with your understanding of football. I’m making this assessment of your comments as someone who has participated and supported football programs for at least 4 decades. And your added comment about the use of foundational muscles (?) respectively concerning football players and sprinters is even further off the mark. The author very well understands the game of football as well as dozens of other sporting activities combined with the mechanics and training involved. Perhaps he will shed some light on your perceptions. P.S. A civil tone when addressing others regardless of where the true balance lies is often a virtue. Sorry, but I think yours was the least civil tone in this whole discussion. Mary was correct about the rationale for the 40 yard test, you can look it up. Bless you but your and Mary’s irrational conclusions don’t make them correct. On the bright side, your “you can look it up” statement brings humor to the post. Ok everybody – let’s get this straight first of all. The 100m sprint is not a paced race. To an extent the 200m is, but not 100m. It is an all-out sprint at 100% – no less. There is no real strategy : you don’t conserve your energy for the last 30m, you don’t change your strides deliberately etc.). I think what the combine comes down to is acceleration. To Mary’s point, football players might be known for good acceleration because that is critical to a 30-40yard carry. But they will very likely fade when they hit 70m if they continued running. Acceleration is a skill and talent that not everyone has. Look at Carl Lewis and Donovan Bailey – their starts and acceleration are average at best. It’s not to say that they don’t train on this phase of the race, but rather they probably just don’t have that natural ability. Plus they probably focus more on the latter part of the distance (70m+) in their training. But bottom line is – guys like Carl and Donovan are still running 100% between 0 and 40m. Anyway, no disrespect to proponents of either side. There is obviously a cross-over between the two sports. I believe it is quite possible football players can beat some world class sprinters to the 40, but because they don’t reach top speed until at least 60m, we can’t really draw a parallel by suggesting that the best combine footballer could win Olympic Gold in the 100m. Bo Jackson was a worlds class sprinter and ran worlds class 100m times but football and basket ball paid my bills. So he ran 4.12 and a 4.18 the fastest 40yd times ever …. Bo ~ Bo Jackson was an astonishing athlete, but he played football and BASEBALL (not basketball). Right?